Datamax-O'Neil p1725 - Thermal transfer Printing, 300 dpi, 6" Print width, USB and Ethernet Interfaces, US Power cord. 1.5" x 1" Direct thermal paper label. 5500 labels/roll, 16 roll case. Also available as a single roll (Part# 301977-R). 4.33" x 984' Black Wax-Resin Ribbon. Compatible with E-Class Mark III Printers. 24 ribbon case. Used with polypropylene labels. 3.5" x 360' Black Wax Ribbon. Compatible with E-Class Mark III Printers. 12 ribbon case. Used with paper labels. Also available as a single roll (Part# CJ-IQWAX+-89110-R). 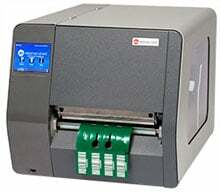 The Datamax-O'Neil PBA-00-48000N04 is also known as DMX-PBA0048000N04	or PBA0048000N04	.